The egg timer is a quick and convenient way to set up personal reminders like when you phone a friend and they ask you to phone them back in 15 minutes. The egg timer can also be used to switch off your monitor, shut down your computer or run a program of your choice when the timer runs out. 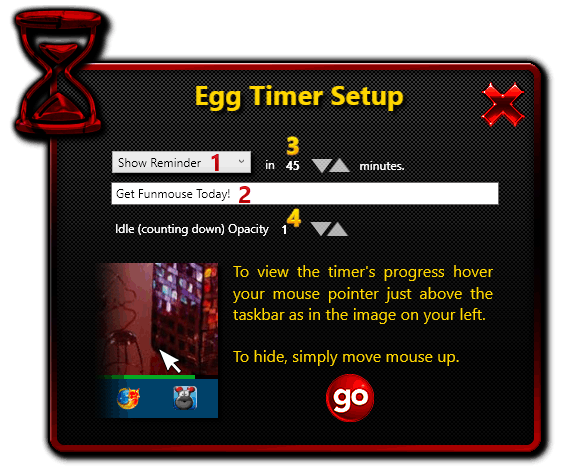 FunMouse lets you create up to three egg timers at a time. When you set up a reminder egg timer, this area is where you can type the reminder message you want displayed when the timer runs out. FunMouse will save the last message you used and automatically fill this field with it the next time you set up a reminder egg timer again. This makes it convenient if you sometimes use the same reminder often. When you set up a program to be executed when the timer runs out, this field changes to display a watermark instructing you to double-click it to browse for the program you want to run when the timer runs out. The time in minutes after which you want the option you selected in the drop-down options to be performed. This value can be adjusted by clicking on the up or down triangles, however, the fastest way to adjust this value is to hover your mouse over one of the triangles and scroll the mouse wheel up or down. As this is a count-down timer and not a scheduler, the maximum amount of time you can specify is 1440 minutes (24 hours or 1 day). If you require events and reminders for future dates longer than 24 hours use the Event scheduler. The idea behind the egg timer is to be as unobstrusive as possible while also letting you know at a glance notice how much time is left before the timer runs out. As such, once you have created an egg timer, it lives just above the taskbar as a progress bar 5 pixels in height. You can adjust the opacity of this progress bar by clicking on the up or down triangles, however, the fastest way to adjust this value is to hover your mouse over one of the triangles and scroll the mouse wheel up or down. The images below demonstrates what the egg timer will look like while it is counting down in various opacities. Irrespective of the amount of opacity you specify, any timer above 8 minutes will return to 100% opacity once 2 minutes remain to give you enough warning time if you want to cancel it. (See example image below). Timers less than 8 minutes will also become 100% visible when a certain percentage of time remains. There may be times when you want to turn the idle opacity all the way down. (Example: watching a movie). When you hover your mouse just above the taskbar in the vicinity of where the progress bar should be, the full egg timer window will become 100% visible to indicate the amount of time remaining. When the full window is 100% visible you can either choose to close the timer by clicking the X on the right or move the mouse cursor up towards the centre of the screen to hide the window again.